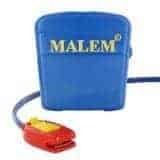 If your child has been wetting the bed at night and you are looking for a solution, one of the most effective ways to help solve this problem is to buy a bedwetting alarm (also known as an enuresis alarm). 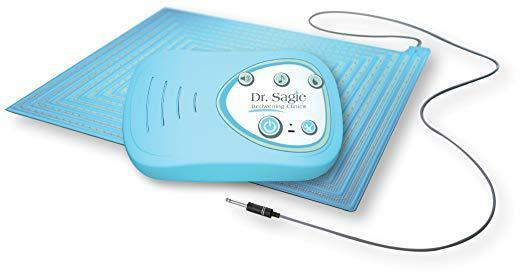 These devices help children by using behavioral treatment (they starts to wet the bed, the alarm sounds, either the parent wakes the child up, or they wake up on their own and empties their bladder into a toilet). It is a relatively inexpensive treatment that generally has a high success rate, although it does take a lot of patience and work for the parent or guardian who is helping the child with this common condition. PROS: High success rate, good interactive website with doctors videos, loud sound with lots of varied choices of alarms. CONS: Expensive, can be a little bit sensitive so it may not work well for children who sweat a lot at night. If you have tried everything and not had any success, you are going to want to take a look at TheraPee. TheraPee is a whole system that combines an excellent quality bedwetting device with web-based interactive software. This system can customize the program based on information that you give them. Once signed up, you get access to a “virtual chart” that maps progress and provides advice and encouragement. Users love the video session and online tracking tools. TheraPee guides your child through all aspects of the process, and most parents find the feedback that you get from the system helps to have the child take ownership of his or her progress and success. Users also love the excellent quality of the unit. It is durable; the sounds are loud and clear. You can also select different sounds, adjust the volume, and also adjust the sensitivity of the pad. What could be improved? The cost of this system is quite high and may be out of reach for families who need it most. PROS: The Malem Ultimate combines light, sound, and vibration to help wake up very deep sleepers. Most users find it lightweight and comfortable. This device comes with a smartphone app that has instructional videos and a FAQ. It also has a 2 step turnoff. CONS: Some issues with the clip breaking easily. It is a good product heavy sleepers as the vibrate, and audible options are very good at waking users up enough to realize they need to head to the toilet. You get a tracking calendar that helps keep motivation high. A few customers have reported that the clip that is attached to the underwear is easy to break. PROS: Low cost, different tones to choose from, vibrating option. CONS: The clip could be more user-friendly. If you don’t want to spend a lot of money, DryEasy is a good option. It has a loud sound with a good vibration. The reward system has stickers for different types of situations, so the kids won’t be discouraged if they wake up a little wet. The significant selling feature of the DryEasy is that is has a lower price than other brands while having a lot of the same types of functions. It also works well and suits most parents needs. You can use both vibration and sound to ensure that the child is woken up. Users also find the sticker chart to be significant for tracking and helping with self-esteem. What could be improved: A clip that is easier for kids to use themselves. 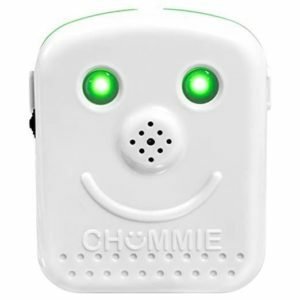 PROS: Uses lights, sound, and vibration to wake kids up. Cute, friendly design. CONS: Some issues with the device not working well after repeated usage. Like all of the bedwetting devices, the parents do need to be involved in the process. The customer service for the company is also reported to be excellent. Some users find the quality of the device could be improved. When is it time to get a bedwetting device? Nighttime bedwetting (nocturnal enuresis) can be very stressful and embarrassing for both children and parents or caregivers, it affects roughly a quarter of children past the age of 5, then as they get older the percentage drops steadily. Unfortunately, 1 to 2 % of kids still have trouble with this condition until the age of 15. If your child is wetting the bed at night and this is becoming an issue, you can discuss your options with your doctor. In most cases, they will likely recommend initially limiting liquids before 2 hours before bed, and eliminating caffeine from their diets. 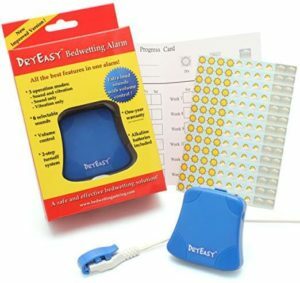 If the child continues to wet the bed, the next step could be trying a bedwetting alarm. It is difficult for kids to learn to hold their urine for an extended period, especially if they are a deep sleeper, so they should never be scolded or punished for something that they are unable to control. Bedwetting devices can help children learn how to wake up on their own when they feel that their bladder is full. There is no set age when kids need to stop wetting the bed, and it is best not to put too much pressure on them when trying to help with this condition. However, if the child is embarrassed when sleeping over at friends’ houses or you are tired of spending a small fortune on pull-ups, then it is probably time to try out a bedwetting system. These types of devices tend to require the most commitment by the caregiver to make sure that the product is being used in a way that will lead to success. It is generally not a quick process; a lot of customers find that they don’t find success until the 6 to the 8-week mark of using these types of devices. Some customers find that a particular system doesn’t work for their kids, so they try a different style or brand. If you aren’t successful with one product, you may decide that the child may not be physically ready to stay dry so you can stop and then try again after a few months. The price of these types of systems can range from around $40 to $300 for a full system. You can get slightly cheaper or much more expensive models, but most of the most popular and well-reviewed products fall within the above price range. You can get a useful product without having to spend too much. The most important feature that you should be thinking about when you are looking for one of these devices is whether it will be comfortable to wear. If your child sleeps on their stomach, they may not want to have something attached to their underwear or some kids may object to having the units connected to their shoulder, so you should look at the wireless models. The three primary forms are wearable (sensor in the underwear, device attached to the shoulder), wireless (sensor connected to the underwear, alarm in a remote unit placed beside the bed), and pad (sensor positioned in a mat that the user sleeps on, alarm connected to the pad with wire and set beside the bed). The loudness of the alarm should also be a factor if you are looking for a device for a deep sleeper. A lot of the alarms have a .dB level of around 80- 85 .dB, which is very loud. Most manufacturers don’t list the .dB levels, but if you are interested in a particular model, you can write to the manufacturer to check loudness. Many of the newer models are using wireless technology; this is generally the most comfortable for the users, as they don’t have to be attached to any wires, so it is easy to move around. If you are looking for a product for a deep sleeper ensure that you get one that includes both an audible tone and a vibrating sensor. Having the device vibrate will help ensure that the user awakens. These devices generally all come with a reward system; it is crucial that you use these systems to help ensure success with the program. Finding success with these types of products can be a long process, so give yourself lots of time, don’t start a few days before a planned sleepover. 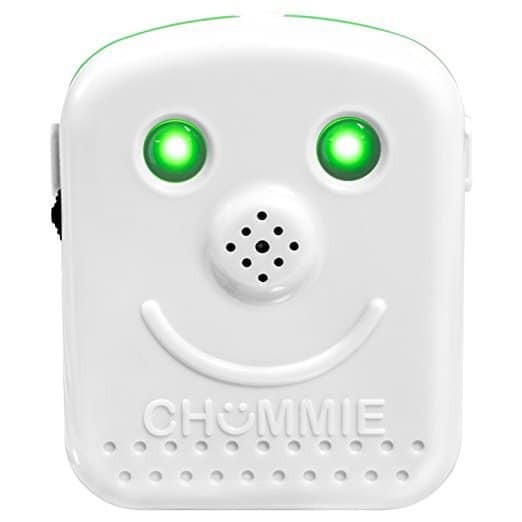 The way these devices work is that there is a wetness sensor in the underwear that is attached to a device when the sensor gets wet the unit will sound and wake the child, so they can get up and urinate in the toilet. With continued use of the system, your child’s brain will slowly be trained to wake up when there are the first drops of liquid hitting the sensor, and they will be able to stop the flow of urine. It sounds simple enough, but it takes an incredible amount of time and effort on the part of the caregiver to ensure that the child is getting up each time it goes off, this training can take up to two months, so that can be a lot of interrupted sleep. Enuresis alarms can range in price from about $40 to more than $300, which seems like a lot of money to pay. However, if you have been using pull-ups and having to do extra loads of laundry, you can factor that into the cost. You may discover that you end up ahead using the enuresis devices over other methods. If the system has been recommended by a doctor, some insurance plans may cover the cost of the device. You can buy these type of products at medical supply stores, drug stores and online. You may have to try a couple of different brands before you find what works. Make sure you are aware of the return policy of where you are buying from since you don’t know what will work for your family until you test it out. There are three main types of devices, although they generally work on the same principle. There is a sensor that detects moisture either in the underwear or in the pad, and an alarm is triggered. The most popular type is a wearable style. Wearable means that the sensor connects with a wire to the primary device that is generally attached to the shoulder. It is placed near the ear so that it is more likely to awaken the child. Wearable options often also have a vibrating choice that helps the user to awaken. You can also get wireless styles where the sensor is connected to a unit wirelessly, allowing users to place the central unit across the room so that the wearer must get out of bed to turn the device off. These wireless device also will enable an alarm to be sounded in the caregiver’s room. Another style is a pad option. This style doesn’t attach to the body at all; instead, the sensor is in the pad that is slept on. The central unit is usually connected to the pad with a wire and when the sensor detects moisture a separate bedside alarm sounds.